Wake up and get your day moving with this refreshing orange-flavoured aloe gel. 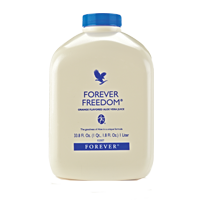 Forever Freedom contains all the benefits of our plain gel but with added glucosamine, chondroitin and MSM – popular with those who lead an active lifestyle. Shake well. Take 60-120ml daily. Stabilised Aloe Vera Gel, fructose, flavouring (orange juice concentrate), glucosamine sulfate (crustaceans), chondroitin sulfate, methyl sulfonyl methane, acidity regulator (citric acid), antioxidant (ascorbic acid), preservative (potassium sorbate, sodium benzoate), antioxidant (tocopherol). Allergy advice: for allergens, see ingredients in bold. Store in a cool, dry place away from children. Food supplements are intended to supplement the diet and should not be substituted for a varied diet or healthy lifestyle. Do not use if pregnant and/or breastfeeding or people taking anticoagulant drugs. If in any doubt, consult your doctor if you have a medical condition or are on medication. Do not use if seal is broken. Do not exceed recommended dose. N.B. Contains shellfish (shrimp, crab and lobster).